Firefox will display the feed in its standard format. Note that if it's a Feedburner feed you may get a web page and will need to click the 'View feed XML' link. Once loaded, go to menu Tools>Web Developer>Page Source, (or command-U (Mac) will do it) to view the source code. You can also validate a feed by going to http://www.feedvalidator.org and pasting the feed URL into the entry field. If the feed is fully valid the code won't be displayed, but if FeedValidator sees any errors the code will be displayed with errors listed at the top (with line numbers) and highlighted in the actual code. Similar alternative services are provided at http://castfeedvalidator.com (which also checks your media files), http://validator.w3.org, http://www.rssboard.org/rss-validator/ and http://xmlgrid.net/validator.html. Apple have also added a validation facility at http://podcastsconnect.apple.com but this will give very little indication of any errors if the feed fails to validate. Note that some errors are irrelevant. It often says ' Your feed appears to be encoded as "utf-8", but your server is reporting "US-ASCII" ' and this appears not to matter since feeds with this error still work OK. You will also often see ' Missing atom:link with rel="self" ' which you can ignore as it's only to do with the old RSS reader Atom. Also Feedvalidator does not recognize recently implemented tags 'itunes:order', 'itunes:isClosedCaptioned' and 'itunes:complete' and so will flag them as errors, which you can ignore. Another error is to include an unescaped ampersand - '&' - in a feed: for example 'Sausage & Mash' as a title or description. The ampersand is used to indicate the beginning of an HTML code - for example &#934; is the code for the Greek character Φ. If you have an ampersand by itself it indicates the start of expected code: but as no code follows, nor the ';' which indicates the end of code, the rest of the feed appears to be a code which of course cannot be interpreted. As a result of this the closing </rss> tag cannot be read, and its absence renders the opening <rss...> tag invalid, so the entire feed becomes unreadable. The way round this is to use the code for the ampersand - &amp; - which will display the '&' when the feed is read: e.g. 'Sausage &amp; Mash'. 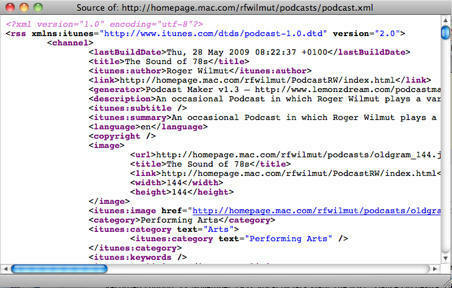 Although it won't wreck the feed, only the episode, the media file filenames must not have spaces in them - spaces are not allowed in a URL and although browsers and some readers will correctly substitute the code %20 for each space, iTunes and Podcasts Connect do not and so see the URL ending at the first space. Apparently missing episodes can be caused by the inclusion of more than one 'enclosure' (the tag used by iTunes to identify the media file) within an 'item' (only the first will be read) or using .wmv or flash media, which iTunes cannot display and will ignore. Including images within 'items' will have no effect whatever: in order to display images for subscribers the image must be embedded in the actual media file (see here). New episodes usually take 1-2 days to appear, the podcast image often longer (and even longer in the Search results) and this often panics people. There have been numerous instances of episodes not appearing, or disappearing, from the Store when they appear when subscribing and the feed appears to be OK. The first step in dealing with this is to go to http://podcastsconnect.apple.com and click the 'Refresh feed' link (under 'Additional Information'). This usually solves it, but failing that contact Support - go to https://itunespartner.apple.com/en/podcasts/overview and click the 'Contact Us' link at the bottom of the page. This means that a character which can't be read by browsers or iTunes has been included: this for example could be a 'smart quote' or other special character or formatting code caused by copying from a word processing program. It may displayed like this - - or may even be invisible when the feed is examined in a browser. Its presence can throw the entire feed and, again, cause it to become unreadable. The cure is obviously to remove the offending character, or in the case of a 'smart quote' replace it with a straight quote. You can test whether iTunes likes the feed by choosing 'Subscribe to Podcast' from the 'File' menu in iTunes 11 or the 'Advanced' menu in earlier versions, which produces the same result as subscribing from the Store page: very occasionally a podcast can be read by the iTunes application but not the Store (when you subscribe the Store is not involved). The Apple submission page at https://podcastsconnect.apple.com/ provides a very basic level of validation, though with very little explanation - basically it just tells you whether they like it or not.